A large crowd of buyers turned out for BCA’s recent Classic & Historic sale at the Bridgwater auction centre on Tuesday 31st July 2007. Bidding was strong throughout the sale and nearly sixty percent of the lots were sold on the day. One of the strongest selling cars on the day was the 1960 Jaguar Mk 2 2.4 saloon, which roared past its estimate of £8,500 to sell for £12,875. Finished in Sherwood green with tan leather interior and sitting on chrome wire wheels, the car had been comprehensively restored some 15 years ago and had been little used since. Dating from mid-1928, the Austin Twelve Clifton Tourer also sold well. Finished in maroon with black wings with a hood in beige double duck, the car was in excellent order in all departments. Originally registered in Dewsbury, Yorkshire the car had been restored during the 1980s and had covered less than 700 miles in the last 25 years. It sold for £13,150. The 1950 Ford V8 Pilot was in ready to restore condition after being laid up for many years. Essentially original throughout, this Ford was presented needing a complete repaint but was fully running and was driven into the auction hall. Offered with an extensive history up to the late 1960s this saloon sold for a reasonable £2,850. The most modern classic sold on the day was the 1993 Jaguar XJS Convertible. This 4-litre model was smartly finished in Signal red with tan leather interior. The car had been carefully maintained and during the past two years the interior had been refurbished and a replacement hood in black fitted. It sold for £6,275. First registered in London in May 1929, the Austin Twelve Windsor was correctly finished in blue and black with blue interior trim. The car had clearly undergone restoration at some point and had been in the previous ownership for some 28 years. Running well, the car had been properly maintained and all the major mechanical components were in good order. Offered with the original London registration number of ‘UU 5’, this charming vintage saloon sold for £16,775, the top price of the day. The oldest car in the sale – the 1925 Chevrolet Superior Tourer - was built at the Tarrytown Chevrolet Plant in New York in March of that year. It spent its initial 30 years in New York with the next 35 years being spent in Australia, before coming to the UK in 1990 and undergoing a comprehensive restoration, which took some seven years. Finished in cream and black with grey leatherette trim and full weather equipment, the car had spent recent years working in the wedding hire business. 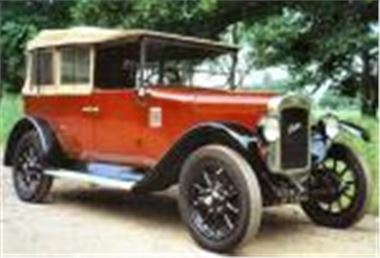 Although fitted with a later Ford engine, the car represented good value for money and sold for £5,175. Among the many items of automobilia, two small desk Austin Desk Mascots from the 1920s created a stir selling for £625 – over five times the top estimate. BCA’s next Classic & Historic sale is at the Blackbushe Auction Centre, Surrey, on Tuesday 2nd October, commencing at 12 Noon. For further details please contact the BCA Classic & Historic Division Information Helpline on 01252 877317 or email bcahistoric@bca-group.com.